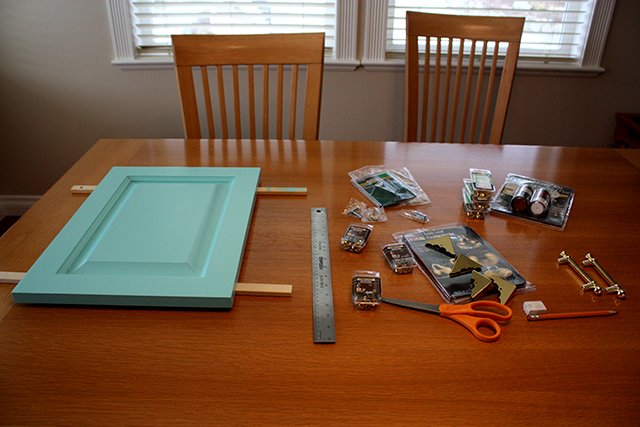 Last week Sherry from Young House Love mentioned that the Fall Pinterest challenge was back. And today is the day when all the projects get posted. I participated in the Summer Pinterest challenge in August, (you can read about it here), and really enjoyed the extra nudge to start and finish a project on such short notice. I felt spurred on every day knowing there was a deadline looming, and I bet I wasn’t the only one! So when I heard the pin-fest was back, I was definitely up for another challenge! This is my Pinterest inspiration. 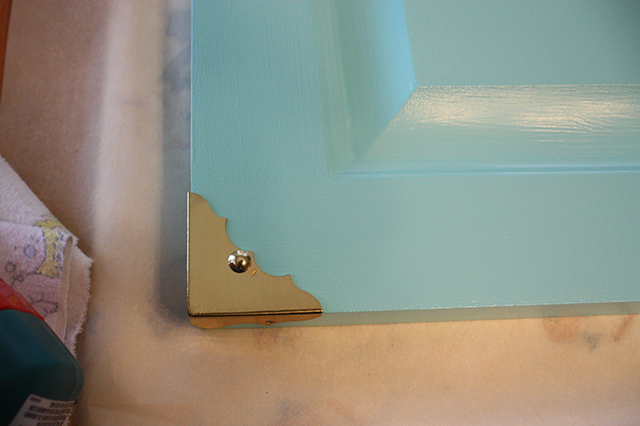 I’ve never tried gold leafing before, and was super thrilled to find the tutorial for this tray on Pinterest. Isn’t the tray awesome? 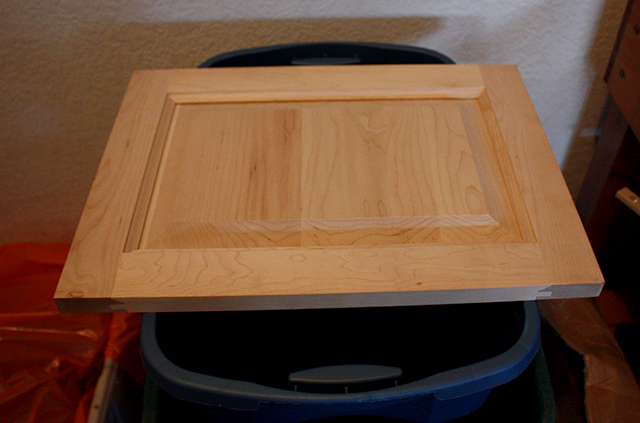 And this is the other tray I pinned, because I liked the idea of repurposing a cabinet door like this. 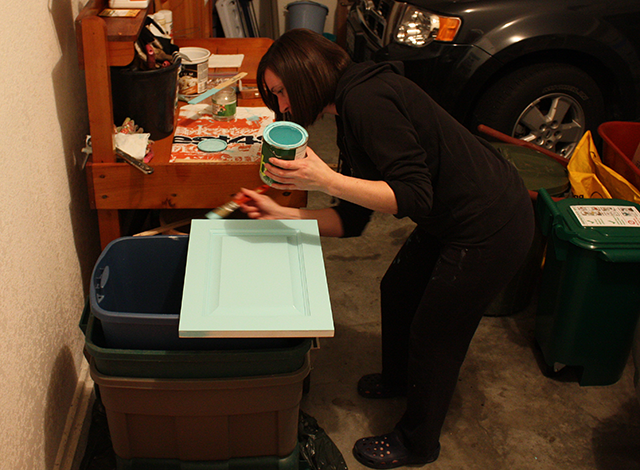 And you might have guessed… making a tray from a salvaged cabinet door. I picked this one up at ReStore. It was a brand new door, never been primed, painted, or stained. Perfect! 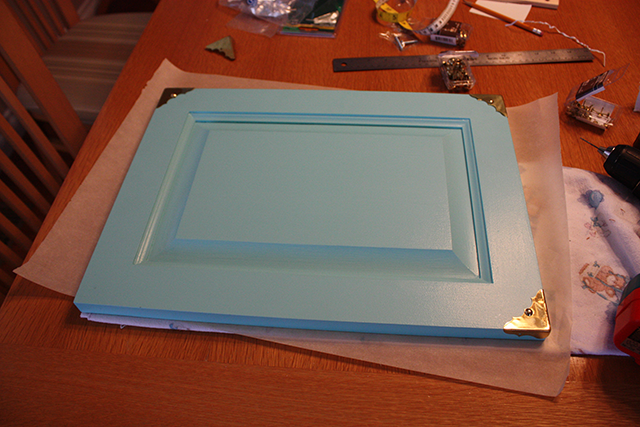 To tie in with the cabinet I just finished, I decided to paint this door in the same colour. And to compliment the gold damask fabric on the pine chest, here is some of the hardware I decided to use. I wanted to give the tray a hit of Hollywood Glam, so decided to go with all brass hardware, and accents. I started with the brass box corners. I picked these up at Canadian Tire in two different sizes, and ended up using the larger ones. The corners came with screws for mounting, but I swapped them out for small brass furniture tacks instead. I thought they would look better with the nail head trim I had planned. 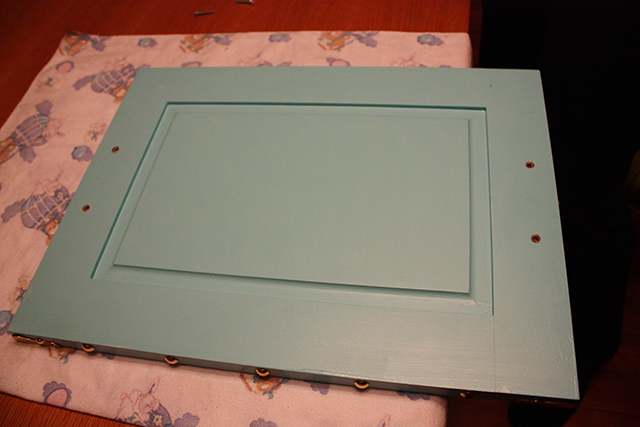 Next, I trimmed the sides in larger brass furniture tacks… and this is where pre-drilling the holes was the way to go. There’s no way the tacks would have survived otherwise. They would bend and/or break, and the rounded shape would take on an unintentional ‘hammered’ look! I placed a felt pad on the end of my hammer to save the tack. 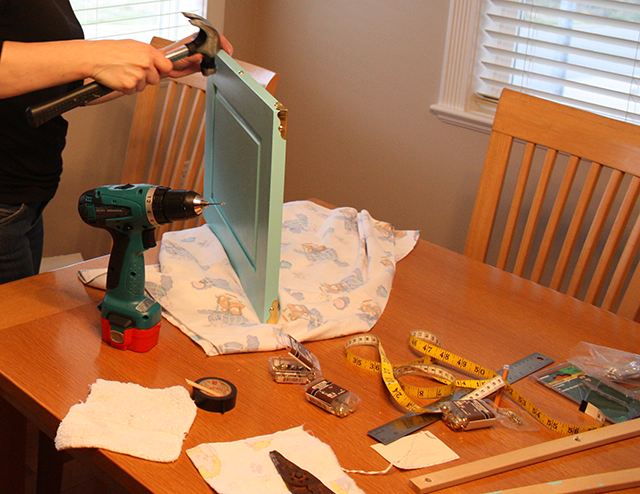 After the brass corners were in place, and all the trim was finished, I had to ask my hubby for some help. Next came mounting the handles, and this job was better with two sets of hands. Besides, he’s better with the drill for this kind of task. 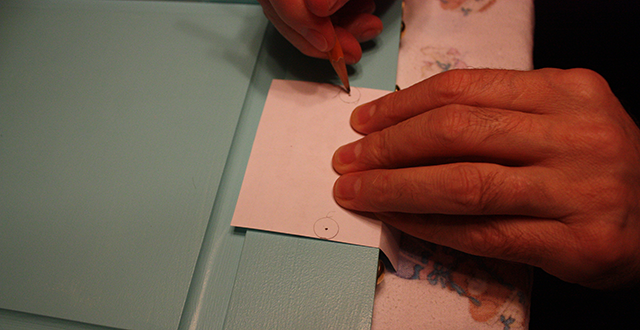 But first we needed to create a mini template for the screw holes. 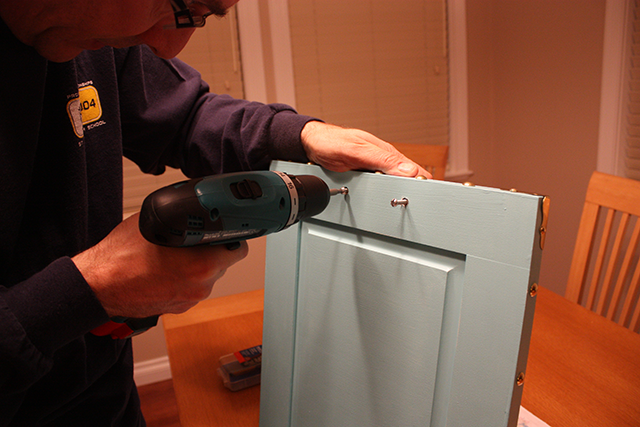 And then drill the holes. This part went a little slower. We swapped out the screws that came with the handles because the head was quite large, and we wanted to counter-sink them. Just to be sure to save future surfaces from harm. I couldn’t decide on the gold leaf, but if I do go ahead with it, I’m thinking just in the center of the tray. What do you think? Would you go with gold leaf? 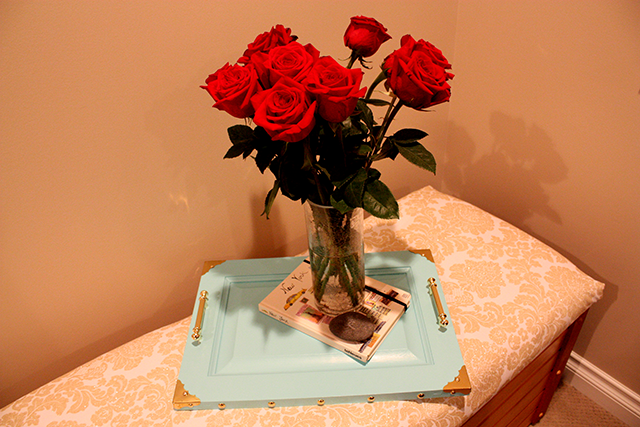 Here’s a look at the tray on the re-covered pine chest in Kaleigh’s room. Slowly, piece by piece, her room is starting to come together! Another Pinterest challenge wrapped! Check out all the Fall challenge submissions here (mine is #100). And for the Summer challenge submissions, click here (mine is #201). Looking forward to seeing what you came up with this time! Yes! 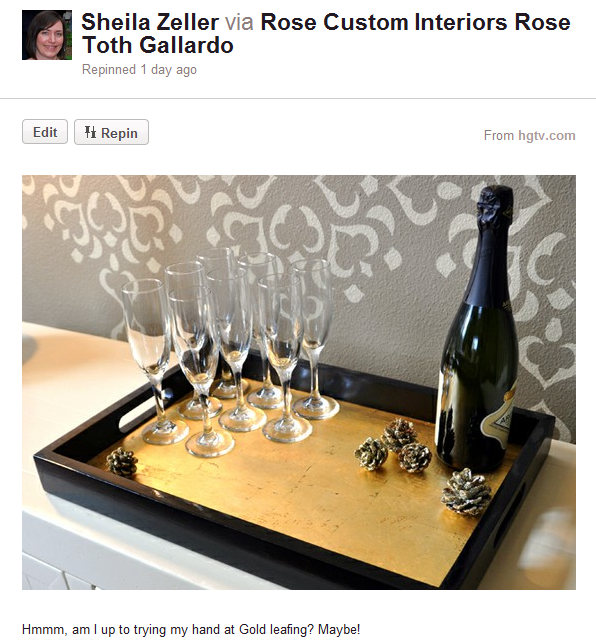 Do the goldleaf in the center – LOVE your tray!!!! This turned out pretty cool! I have a pinterest inspired tray on my to-do list as well. I love that you made it such a pretty blue color! The Fall Pinterest Challenge is such a cool idea! I look forward to seeing all of the projects. 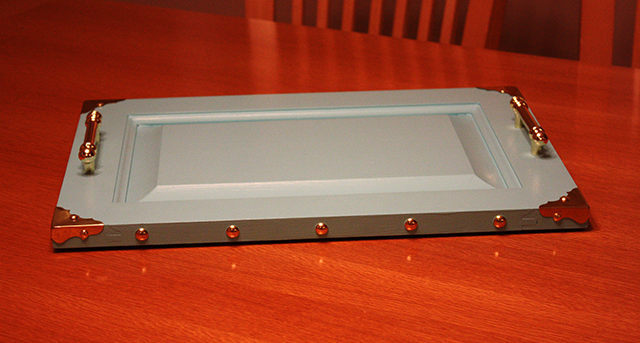 Super job on your tray – LOVE the color. I’ll be the one to vote against gold leaf – it’s beautiful as is. Thank you so much Pauline! Keep an eye out, because there’ll be a Winter challenge coming up in January some time… would love to see you there! And I’m leaning to leaving the tray as is, so I appreciate your feedback on that! Thank you! So, do you ever enter the challenge? You have so many amazing projects to share! You rock, Sheila!!! 🙂 Seriously! I love it! It looks fantastic! You’re so clever, my friend!!! Have a gorgeous day, my talented friend!!!! Luciane, you are so awesome. Thank you! 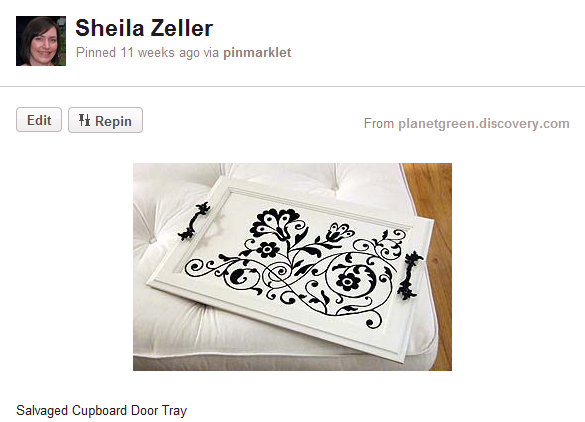 I think your tray is great – I love the corner hardware pieces.